But at $1,700/£1,300 (around AU$2,185), it’s not exactly an everyman’s device. For that price you get a portable gadget that acts as both a projector and a Google Assistant-powered smart speaker in one nifty package that transforms any flat surface into what’s essentially a moderately functional Android touch tablet. Most of the time you’ll probably just use it as a 23-inch touch display on surfaces like counters and coffee tables, although you can expand that to 80 inches for viewing movies or games on the wall. Quality obviously suffers the larger you make the display, though, as it’s only capable of a 1366 x 768 resolution. As we said in our hands-on from February, it’s also kind of dim, as it offers only 100 lumens of brightness and a 4,001:1 contrast ratio. Sony likely reined in the brightness in order to extend the battery life, which nevertheless only lasts a pitiful hour without access to a direct power source. Still, it’s about as responsive as a regular tablet, thanks in part to its impressive 13-megapixel camera that captures your movements and interprets them at 60fps in infrared light. Remarkably, you don’t even have to touch the wall’s surface to interact with the projection, as holding up your finger in front of the camera usually suffices. It’s a cool concept – and one that might have some cool implications for the future – but for now it’s probably better seen as a rough draft of the technology. 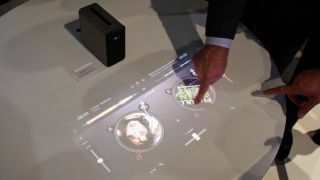 As we said in February, “Essentially, if Sony created an Android tablet at the size of the iPad Pro that you could use around the house, it would have all the benefits of the Xperia Touch without the lack of brightness you get with a projector." Clearly someone doesn’t mind slinging around this kind of cash for such a futuristic toy, though, as it’s already sold out on Amazon. With any luck, you'll also be able to pick it up at Sony Square New York City and some T-Mobile outlets in Chicago, Los Angeles, and Miami.